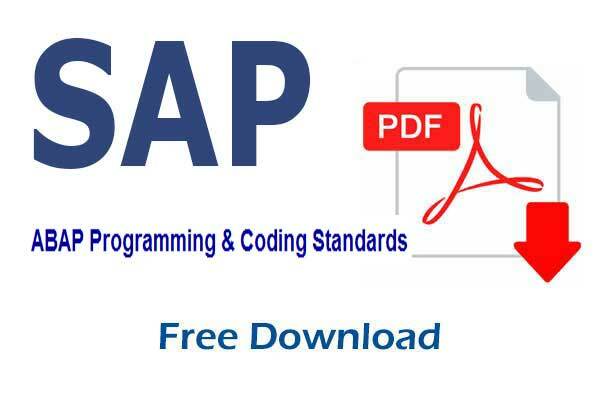 This document is a compilation of possible ABAP programming and efficiency standards and will provide guidance in creating readable, maintainable code. It is intended for all developers in the SAP R/3 Implementation Project Diamond at Novartis, USA. The ABAP language is an “event driven”, “top-down” programming language. The ABAP processor controls the execution of an event. For example, the event AT SELECTION-SCREEN is executed when the user presses ENTER on the selection screen and the event START-OF-SELECTION is executed when the user executes the program. As the ABAP language incorporates many “event” keywords, it is necessary to implement in-house ABAP coding standards to create consistent and efficient maintainable code. As a standard, The Object Browser should be used for all development in the SAP system. A Source Code Change Process should be in place and adhered to prior to making changes to production ABAP programs and SAP source code. The reader is also referred to the section dealing with the Naming standards required by this project when dealing with the CTS (Correction and Transport System), this is contained within the Appendix of this document.